Ocean Prime is celebrating National Surf & Turf Day. Even though 2018 isn't a leap year, Ocean Prime in Philadelphia still plans on celebrating National Surf & Turf Day, which falls on Feb. 29. Any excuse to treat yourself, right? On Wednesday, Feb. 28, the restaurant will offer a special surf & turf option from 4 to 10 p.m.
Get ready to drool. 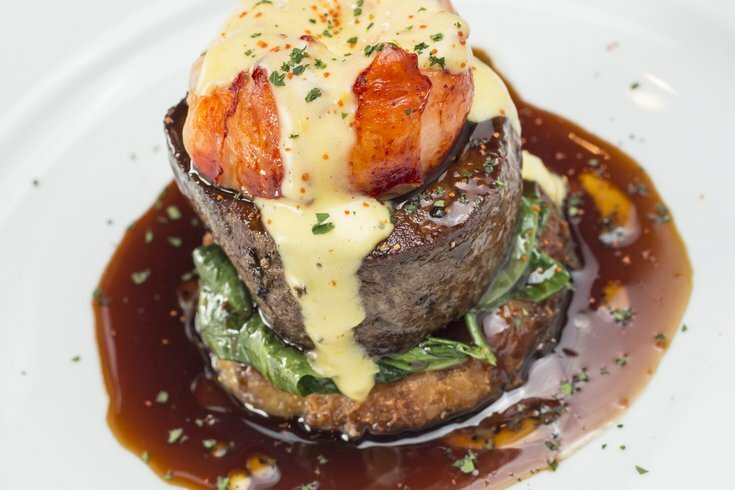 The holiday special will be a 6-ounce filet mignon and butter-poached lobster tail over a crispy gouda potato cake, served with chili seared spinach and a cabernet truffle reduction. Hollandaise sauce will top the lavish dish, which will be $58. Ocean Prime will also launch a new happy hour on Wednesday night. There will be a selection of small plates and sushi for $10, as well as mini shellfish towers and $10 cocktails and wines by the glass. Happy hour is daily from 4:30 to 6:30 p.m. in the restaurant's lounge.